Mix all ingredients together in a small bowl and press into the bottom and up the sides of a 9 inch springform pan. Refrigerate while making the filling. Preheat the oven to 350° F. Place the unpeeled cloves of garlic in a small ramekin or ovenproof dish with the olive oil. Bake, uncovered, for 10 to 15 minutes, or until soft when tested with the tip of a knife. Reduce oven temperature to 325º F.
Squeeze the roasted garlic out of the peeling. Mash or chop the garlic to make a puree. Combine the pureed garlic, cream cheese, crème fraiche, whole eggs, flour, and salt in the workbowl of a food processor. Process for 2 minutes. Add the parsley, chervil, basil, oregano, and sage and process for 1 minute. Pour the cream cheese mixture into a large mixing bowl. Stir the red peppers and carrots into the mixture. Season with salt and pepper to taste. In a clean bowl beat the egg whites until soft peaks form. Blend a spoonful of egg whites into the cream cheese mixture, then gently fold in the remaining egg whites. Pour the cheesecake batter into the springform pan with the chilled crust. Line a baking pan with foil and set the springform pan on top of the foil. The baking pan will catch any drips. (If the springform pan is not very tight, the butter in the crust may melt out.) Using the additional herbs and vegetables, float a design on top of the batter. Place the cheesecake in the baking pan in the oven and bake for 45 minutes. Turn the oven off and allow the cake to remain in the oven for 1 hour longer without opening the door. When done, the cake will rise up and the center of the cake will be almost set and will not appear liquid. Don't worry if the cake is cracked. Remove the cheesecake and set it on a rack to cool for 1 1/2 hours. Remove the outer portion of the springform pan. Slide the cake onto a serving plate while removing the bottom. Serve warm or cover the cheesecake with plastic wrap and refrigerate overnight. 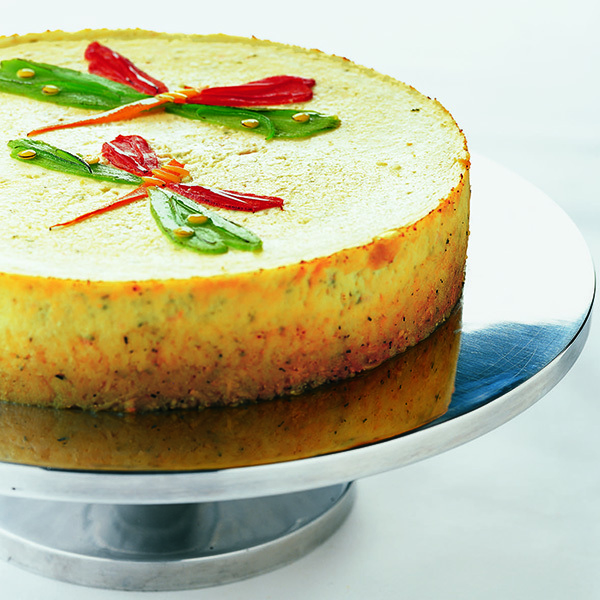 Remove cheesecake from refrigerator at least two hours before serving and allow it to come to room temperature. The cheesecake is lovely served whole for a cocktail buffet party. It can also be cut into wedges and served on individual serving plates. Reduce the cream cheese to 12 ounces (1 1/2 cups). Add 12 ounces (1 1/2 cups) crumbled Stilton. Proceed as above.